I am a Auckland based photographer who is really motivated and passionate to be able to help you build a portfolio while working on my own! I'm looking for new models who constantly are in need of photos to update their own portfolio, instagram and more but at the same time help me update my existing one. 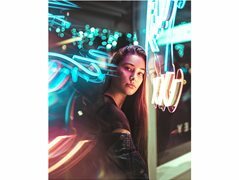 I'm currently after models who would like a creative flare in some night style / neon portraits shot, but i am also open to doing other casual shots if suitable as i love trying out different things so im happy to explore any variety you may have that you wish to try but also what you feel most comfortable with. I'm always open to new ideas and concepts if you have any but mostly would like it to benefit you. Its about having fun but also making the most out of our time together on the shoot, I'm also happy to shoot again with you if you choose to, im happy to cover for any small necessary expenses like food etc as long as we can manage our time efficiently. You should have your own access to wardrobe and makeup.